SpaceX has been talking up its Martian travel plans for a while now, but we still don’t know how it intends to get (or survive) there. As of today, however, it’s cleared a major hurdle: the rocket engine it will use to get to the Red Planet just fired-up for the first time. 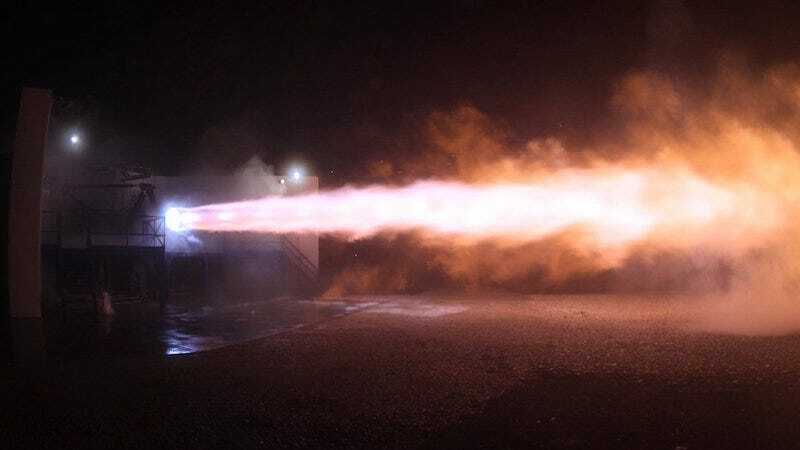 Musk also revealed a few specs for the rocket engine, including its thrust capabilities of over 300 metric tons, a specific impulse of 382 seconds, and chamber pressure of almost three times greater than that of the Merlin engine in SpaceX’s Falcon 9 rocket. In other words, the Raptor engine is really big and really powerful. These details may also hint at some of the private spaceflight company’s upcoming plans. The Raptor engine’s firing test is a good sign, but a successfully-firing rocket engine is still a long ways away from a fully operational spacecraft and launch system. Tomorrow afternoon, Musk is due to give a speech at the International Astronautical Congress. There, he’s expected to reveal details about his plan to get people to Mars and the spaceship—part of his Interplanetary Transport System—he wants to use to get them (and the supplies to keep them alive) to the Red Planet. Two weeks ago, the Interplanetary Transport System had a different name, though: the Mars Colonial Transporter. Then—after tweeting “Turns out MCT can go well beyond Mars, so will need a new name…” and bandying a few name suggestions—Musk switched up the name to the Interplanetary Transport System. The key word in the new name, of course, is “interplanetary.” Musk might just be hinting that we could soon hear about travel plans that go not only to Mars but also even further in our solar system.